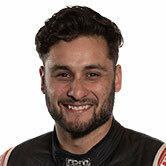 After causing a huge multi-car crash on the opening lap of Supercars Dunlop Series race two at Sandown, Matt Chahda has been excluded from the round. He will also cop a five grid spot penalty at his next race as part of the punishment for reckless driving. Click here for the full stewards’ report. The incident was huge, with Chahda and Bryce Fullwood’s cars flying at turn one. A number of cars were caught up in the accident including then championship leader Jack Le Brocq, who is now second to teammate Garry Jacobson in the standings. Le Brocq was predictably scathing about the accident saying the 22-year old Chahda should “sit down and look at whether he wants to continue racing” after the costly collision. 2004 champion Andrew Jones was also unimpressed. Chahda said after the incident he was still confident in his ability and that it was difficult to run as a privateer against big scale teams like Le Brocq’s Prodrive and Jones’s Brad Jones Racing. “I’ve built the car myself and I work on the car myself. The fact that we even here I think is pretty impressive,” he said. The next Dunlop Series race will be at Bathurst from October 6 to 9. The race is a ‘mini enduro’ 250km sprint.